Ah, motherhood! It’s filled with lots of new emotions and experiences that bring us more joy than we could have ever imagined. But… truth be told, there are some less than awesome elements of newness that come with motherhood too. Lack of sleep and time, feelings of overwhelm and the change from our pre to post-baby bodies top the list of emotionally-draining experiences for new moms. What’s a new mom to do about all of this? Well, the tried and true benefits of exercise, though probably furthest from a new mom’s mind, offer plenty of reprieve from unwanted emotions and that popular post-baby pooch new moms face each day. Want some simple strategies for ditching that pooch and getting your emotions back in check? Read on for a few ways to do just that, and challenge yourself to apply at least one of them to your routine this week. A great way to stay motivated and keep your baby entertained is with an outdoor workout. A jogging stroller has the capabilities to allow you to walk, jog or run with your infant. In addition to its smooth ride, you’ll have an assortment of compartments ideal for diapers, bottles, music and snacks to nourish your run. The comings and goings of the world around you will also be a welcome distraction for both you and your infant. Plus, it’s great to do more than feed, bathe and burp your baby from time to time, and this is the perfect excuse to deviate from that routine. Besides finding the time and motivation to workout, the most difficult part of exercising is keeping your baby occupied. A baby bouncer is a must-have for moms looking to lose that post-baby pooch. These godsends allow moms some hands-free time by simulating a gentle rocking motion. 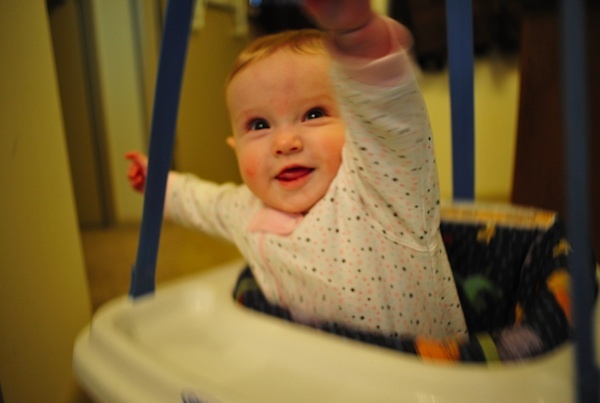 In addition to the freedom they bring, baby bouncers offer a great place for young ones to learn to play independently. With its array of toys, music, vibrant lights and soothing sounds, your child will learn and have fun with exploration. Most babies attain celebrity status the minute they arrive. So why not shamelessly capitalize on this fact by accepting or asking for help a few times a week from grandparents, friends, and anyone else you would trust with your new bundle of joy? This is the perfect time to call in the cavalry and entice them with stories of big beautiful eyes, that new-baby smell, and the cuddle-fest that babies so effortlessly facilitate. An hour workout is just enough time for you to get back in shape and gives grandpa plenty of time to bond with his grandchild. Working out doesn’t have to be all sweat, grunting and moaning. You can still burn calories and have some bonding time with your infant by taking a mommy and child class. Whether you swim together or incorporate your infant into specific exercises, you’re sure to tone your belly, buttocks, arms and thighs in no time. Just don’t yield to the temptation to relax by the pool too long after your swim. If you’re the typical sleep-deprived new mom, that relaxation could lead to a deep sleep in no time! Fitting in a workout can be extremely tough after you have children, and you’ll find that you’re no longer on your own schedule. Your life will be centered round their burping, eating and napping schedule, so you have to gather those precious moments while you can. Instead of exercising for 45 minutes, you can break your workout up into several sessions throughout the day. You’ll still gain all of the stretch and weight training benefits, but you’ll enjoy tackling them in smaller increments. It may be tempting to forgo a workout in favor of catching up on housework or sleep when you have a few free moments. However, you’ll feel energized and ready to take on a busy day after exercising, plus your body will need to be as healthy as possible, because that baby will grow up and need plenty of your time and energy. By employing the above tips, you’re sure to be on the road to weight loss, parting ways with your pooch, and feeling secure knowing your baby is happily entertained. Akilah Richards is a mother of two daughters who are less than two years apart. She speaks from personal experience when sharing articles that help moms prioritize themselves while still being attentive to their babies. Knowledge of the powers of good baby bouncers helped Akilah benefit greatly in incorporating a flexible mindset and healthy habits. I love the shameless call in the cavalry one! I am always changing my routine to fit the need that day. Such great tips thank you so much! Glad you enjoyed that, Stephanie! Heaven knows we need that calvary to be available from time to time! My kids are teens now although sometimes they act like I need a routine like this for them LOL. I include y older daughter in my workouts and have my youngest watch – she loves it! I have my girls join in the fun to keep them occupied! Taking a class together is such a good idea! I did a Mommy & Me swim time when our daughter was a baby, she loved it and I got some good exercise hefting her around in the water! Awesome, Tammy! My girls are now 9 and 7, and we still do classes together. Great way to know. These are great tips! My boys are old enough that I could workout while they played, but with a new baby on the way, I think I’ll be using these tips more. When my kids were babies,they would sit in the playpen or swing and watch me. What a great post! You’ve got wonderful ideas. Its important that we stay in shape to be healthy for our kids. I have a toddler and no one to watch him, so it’s really hard! Great ideas, I love the take a class together. I would just exercise during naps. My kids are grown with children of there own. This would have been some great advise that I could have used 20+ years ago. Oh well, I will definitely share it with my daughters. Thanks for the great ideas! We call in the cavalry for everything else, why not workouts? To me, the first one is such a no-brainer – kids and grownups both need fresh air and new sights and sounds – but it’s amazing to me how many people forego the opportunity to walk or run in the beautiful parks in town and then pay to join a gym and walk on a treadmill! Get outside – it’s good for everyone! I love this idea, I’m not a mommy yet, but will use it “Working out doesn’t have to be all sweat, grunting and moaning. You can still burn calories and have some bonding time with your infant by taking a mommy and child class.”. Thanks. You’re welcome, Theresa! Take all the tips you can before you get to motherhood. I wish I knew some of this stuff in advance!! Good tips. Fortunately for me my children are older now. It is important not to get away from working out when your kids are babies. I didn’t gain weight through pregnancy, but did over the couple years after. letting them get involved is always fun. I use to use my baby as a weight too for legs lifts and things like that. Bouncers and backup are vital to do ANYthing with a new baby! So true, TerriAnn! Sometimes, even finding the time to grabb a shower turned out to be quite a task when a new baby is in the mix! Great tips! When my kids were young I always got my workouts in while the little ones were napping. Those are good tips — you also just have to be committed! If you really, really want to get some exercise in, you will figure it out. So true, Rachel! We can’t wait for the opportunity to show up all the time. Sometimes, we have to create it. My babies always seemed to enjoy the bouncer and the swing. LOL shamelessly calling in the cavalry…best advice ever! These are such great tips. I love the taking a class together idea. These are great tips, now I just need some for distractions from preschoolers..lol! I love the idea of taking a class together. My kids are older, but my boys love to Zumba with me all the time. These are great tips! I need to keep them in mind. Thanks! I try to exercise when Little is sleeping. It’s the only time I can get in a workout unless we go for a walk. These are great tips. I always went to a gym when mine were little that had a kids care area. It was nice to be able to work out and get a break.